HotHead, the creators of Hero Hunters game has just released a brand new park simulation game for mobile. It is an idle game in which you will tap the screen recklessly to build, upgrade, and renovate the park to attract the visitors. The more you attract the visitors, the more Idle cash you will earn. You will invest this money in new attractions(park’s facilities) and unlock all the mascots. It is similar to the PopReach’s previously released game Guava Juice Tub Tapper. So, for us, it was easy to understand the things. 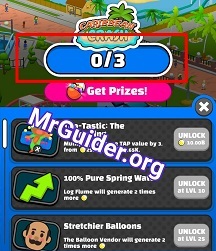 If you are having the trouble in understanding the game’s mechanics or looking for cheats, tips & strategies, then our Click Park guide and Click Park cheats, tips & strategies will help you. The main feature in this game is renovate. The game will show you a renovate button on your screen whenever you reach a certain milestone(earn more coins to hit this milestone). Depending on the progress, the game will give you green money(cash, super cash?). Using this set amount of money, you can renovate the park and activate the certain/permanent bonuses. You can check all the bonuses or boosts on the renovate menu. If you have enough cash, then hit the renovate button and spend this precious money. And hit the finish button. After it, Click Park game will reset your progress; gold, attractions, ranks. You will keep remaining cash(green), tickets(purple in-game currency), and mascots. You will start from the beginning, but with premium boosters that you purchased in the renovation process. Head to the store tab and at the bottom, tap the renovations tab -> there you can check all the purchases and green cash bonus. Tapping the boost will give you more detail. MASCOTS – HOW THEY HELP YOU? The mascot can help you in activating the furry bonus. In Click Park game, the player can select up to one mascot at a time. To use its bonus effect, you just hold down it(tap button) and drag it to one of the attractions in the park. This will trigger the furry bonus and you’ll see balloons on your screen. From these balloons, you can get coins, tickets, and much more. On the main screen of the game, at the top-left tap the Mascots option -> there you can select the Mascot. Since all the Mascot characters provide a unique and special buff, you will have to figure out the best one and select it as the default. You can check their buff details in that menu, under their name. After collecting all the Mascots or costumes in Click Park, a golden clicky costume will get unlocked. Since you need purple tickets in buying these costumes, you will have to spend a lot of time in the game. HOW DO YOU GET MASCOTS OR COSTUMES IN CLICK PARK? First, you need to unlock it and then spend the set amount of in-game currency. New Mascots get unlocked when you rank-up the attractions or park’s facilities. On the main screen of the game, tap on any attraction or park’s facility, just below its name, you can check how many cards are required to jump to the next rank. HOW DO YOU GET CARDS TO RANK-UP ATTRACTIONS IN CLICK PARK GAME? You get these cards from the play balls. You get a free play ball every four hours in the shop menu. And, You can also purchase these play balls in the shop menu by spending purple tickets. Depending on the play ball quality, you get cards and other rewards. You could also get the play ball from the balloons(appear on the screen). And there is a renovation available in Click Park game, named as Prize Balls. Activate this or buy this using green cash and you will get precious play ball as you play the game. In Click Park game, you earn Idle cash or coins by building and upgrading the attractions. But you should not stick with an attraction. Always move on as the high-number attractions give you more cash(new attractions). And as you know, after certain level upgrades, you can unlock perks. In the early game, one of the best perks of attractions is automate-collection. Until you unlock this perk, you collect the coins manually. If ignored, that attraction will be marked as closed. So make sure to unlock this perk as soon as possible and later, focus on the next attractions. You should open the game with an active internet connection. The reason is when you open the game after a long time, the game will give you the ad offer. By watching the video ad, you can double your offline earnings. So that’s all for now as Click Park guide. Let’s take a look at our top Click Park tips, cheats & strategies. This is the same feature, featured in PopReach’s previously released game. A special character often appears on your screen and tapping it will activate the furry mode, allowing the player to earn a massive amount of money in seconds. In Click Park, it’s a balloon vendor. The game will notify you by showing its icon on the right side of the screen. You have to find him in all the attractions. Once found, tap him to get loads of balloons on your screen. From these balloons, you get tickets, coins. In Click Park game, tapping the tap button fills the “TAP!” letters. Once filled completely, you will activate the show time booster. From this boosters, you can generate up to 6X income. So you should keep tapping the tap button recklessly. You can send the mascot to one of the park’s facilities every certain amount of time to get loads of balloons on the screen. Since all the Mascot provides a unique boost, pick the best one and send. You can also skip the time by watching the video ad. At the corner, just above the tap button, there is a small video icon. Tap it and confirm. Watch a short video ad and you will double your income from all the attractions for certain hours. You should activate it before you go offline. If you want precious permanent boosters, then you should spend the cash in renovating the park. 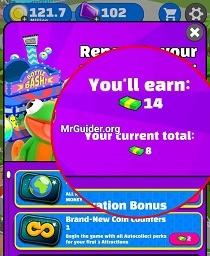 Once the game show you renovate button, tap it and check the amount of cash you have earned so far. Keep earning more money to increase this amount and renovate at the right time – “when you have enough cash for the desired buffs”.